The string shows that this payload is going to download additional files on the system. Now let’s open this file in OllyDbg for obtaining the malicious URL used inside the payload. 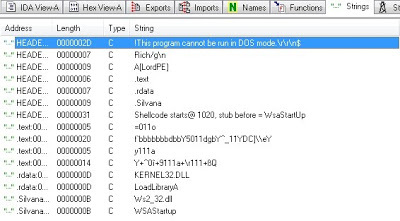 The shellcode starts with NOP instructions followed by another loop which will decode the malicious code. Look at the instructions above, inside the highlighted box. Those are the instructions which are used to decode everything. By stepping through the code, we come to know that there is an instruction that will compare the value with E9 to exit and another, which is XORing byte with a value of 31. We will put breakpoint at the RETN instruction. The code will successfully run and we will be presented with the decoded content, which contains more interesting strings. Look at the highlighted string above in the dump area. This URL will be used to download another binary from the server. 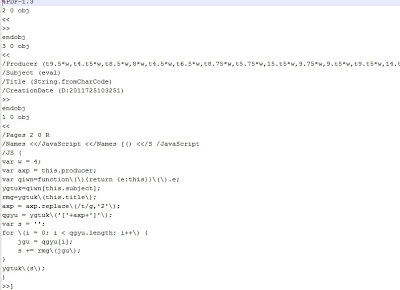 Now, we have identified this malicious payload and the URL used. For reference, here is the result from ThreatExpert for the same shellcode.